Spring cleaning is not just for your indoor living spaces. Landscape maintenance is important to get your yard ready for spring. Debris and leaves should be cleared out from under bushes and trees to give your yard a tidy look. Flower beds and gardens need to be raked as well. Certain plants such as perennials and roses should be cut back. 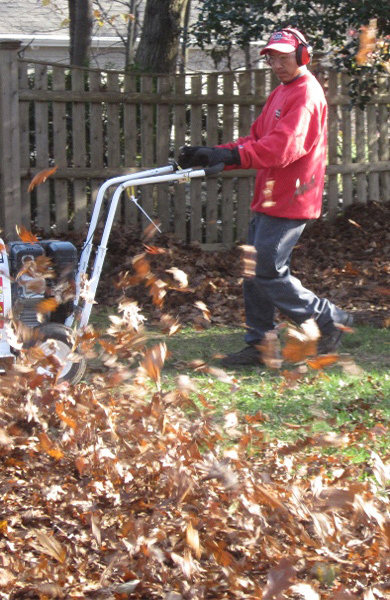 Lawns and mulch should be cleaned of winter debris. Sand contamination should be managed, and your yard may need turf repair because of plow damage. A landscape maintenance professional has the skills to help you complete these tasks so your yard is ready for spring. Dead foliage and leaves can smother your plants and encourage disease. If you have dead annuals in your flower beds, those need to be pulled up and discarded to make room for new plants. Sometimes, old mulch may need to be removed and new mulch placed in plant beds. Hand raking is usually done in smaller beds. It is usually a good idea to put down a fertilizer that is designed for your current plantings. When bulbs flower, a special formula of fertilizer should be applied to extend the bloom time and encourage growth for the following year. This is also a good time to secure any drip irrigation lines that may have come loose, and to have the borders of your plant beds maintained so grass won’t grow into them — and they will have a clean edge. If you have any of the following plants, you should wait to prune them until late spring (after they have bloomed): rhododendron, forsythia, and lilac. The reason why you want to prune (or cut) perennials and roses is that dead, diseased, and damaged stems can attract insects. They also invite diseases to develop or spread, which can kill the plant. Sand, salt, and ash are some of the materials used by road crews during the winter to battle snow and ice on the roads. Some of this material migrates into your lawn and can cause problems. Spring is a perfect time to have a landscape maintenance professional look at your yard and evaluate its health. They should be able to remove sand contamination from your yard. Snow plow operators generally try not to do damage to homeowners yards. Sometimes the damage just happens as a part of these important individuals doing their job. Damage to your turf is not difficult to repair, usually. One option for fixing this issue is to contact your local town government office and find out if they can come to repair the damage. If the maintenance crews have a long list of things they have to do, your yard may not be repaired for a while. Weeds may start to develop while you are waiting, and this makes the repair more difficult and time-consuming. Depending on the damage, those areas of your lawn may need re-seeding or new sod placed. Getting your yard ready for spring is an important part of presenting your home at its best. Landscape maintenance professionals can help you with all the tasks that have to be done when you are “spring cleaning” your plant beds and lawn. They also have the knowledge and expertise to keep the turf and plants on your property healthy for years to come.